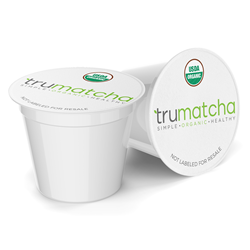 TruMatcha launches a line of matcha products, from tins, to pouches, to Keurig pods for easy-to-brew mugs of tea. The line features a variety of flavors and is notable for being completely organic, vegan, and kosher. TruMatcha has launched, and it brings with it a large selection of ceremonial-grade matcha, flavored and unflavored, to consumers. The pods, akin to K-Cups®, offered through TruMatcha allows owners of Keurig® coffee brewers to make matcha with a button press; those that prefer a more traditional approach can scoop matcha into bowls from the available tins, and iced tea fanatics have on-the-go pouches available to them. The ceremonial-grade matcha contained in the pouches, cups and tins ensure that the matcha offered by TruMatcha is of the highest quality - brilliant green, lightly sweet and packed with nutrients and antioxidants. An immensely popular traditional Japanese drink, matcha is gaining in popularity in the States for both its wondrous amount of antioxidants (ten times that of green tea) and for the impressive, “clean burning” caffeine zip it provides. Beyond the caffeine boost and antioxidants packed into matcha, the drink is regarded as a superfood for its ties to helping prevent cancer (a benefit of the high antioxidant levels), the ties the drink has traditionally with slowing the effects of the aging process of humans, and the nods the drink has towards helping to manage weight as well as help aid weight loss. Pods, tins and pouches are available for purchase through https://trumatchatea.com/ in a variety of flavors, as well as unflavored organic matcha. TruMatcha is not affiliated with Keurig, Inc. "Keurig®" and “K-Cups®” are registered trademarks of Keurig, Inc.